Endothelial marker expressions in TMNK-1 cells. There are some differences in endotelial marker expressions between the original report of TMNK-1and the FACS analysis by JCRB Cell Bank. 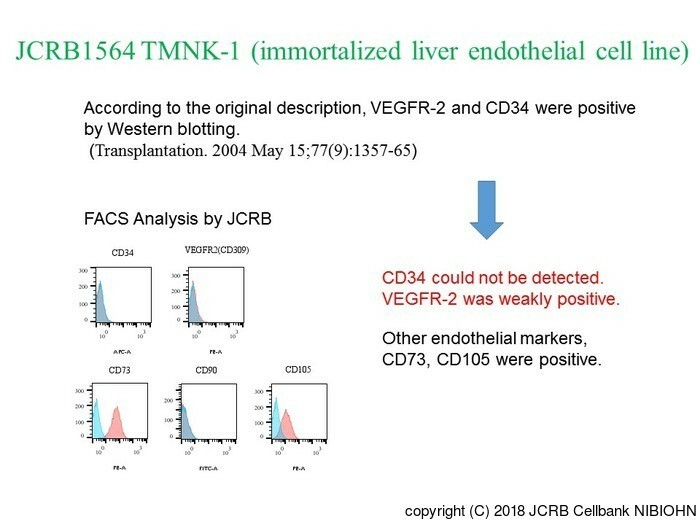 According to the original paper by the developer (Transplantation, 77: 1357-1365, 2004), the TMNK-1 is described as positive for CD34 and VEGFR by Western blotting. However, JCRB's FACS analysis revealed that CD34 was not detected and the expression of VEGFR was low. CD105 and CD73 were detected. 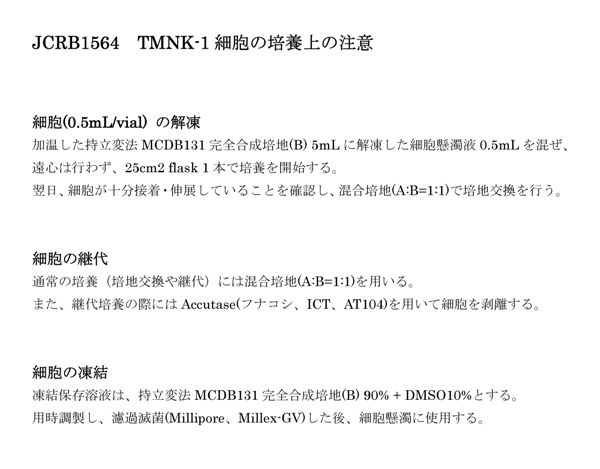 The reason why these descripancy occurred, but there is the possibility that the characteristics of TMD5 gradually change after the development of cells to the deposition at Cell Bank. Immortalized by SV40T and hTERT. Expressed factor VIII, VEGF receptors (flt-1, KDR/Flk-1), and CD34. [Matsumura et al., Transplantation 77: 1357-1365, 2004] should be cited at the paper submission. Distribution restricted to academic Japan domestic user, or only academic oversea users. The following reference should be cited at the publication of paper. Matsumura et al. Transplantation 77: 1357-1365, 2004. 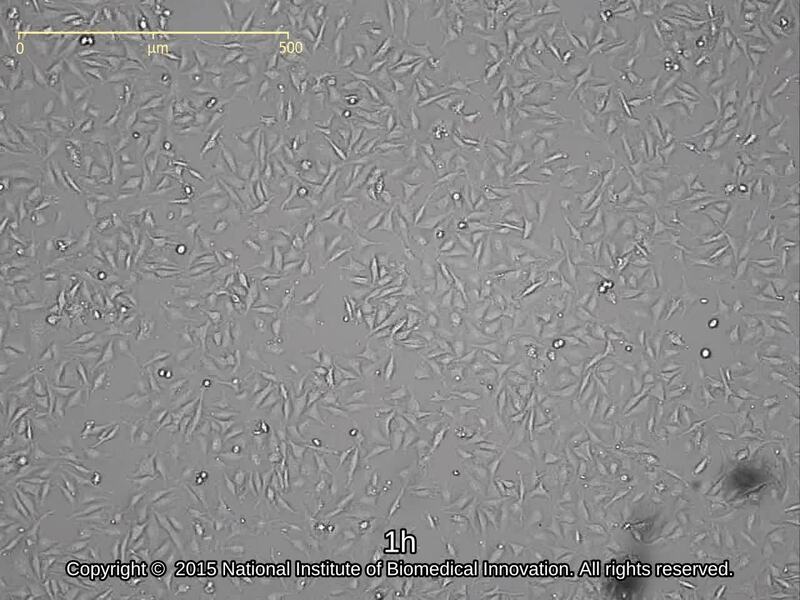 Establishment of an immortalized human-liver endothelial cell line with SV40T and hTERT. 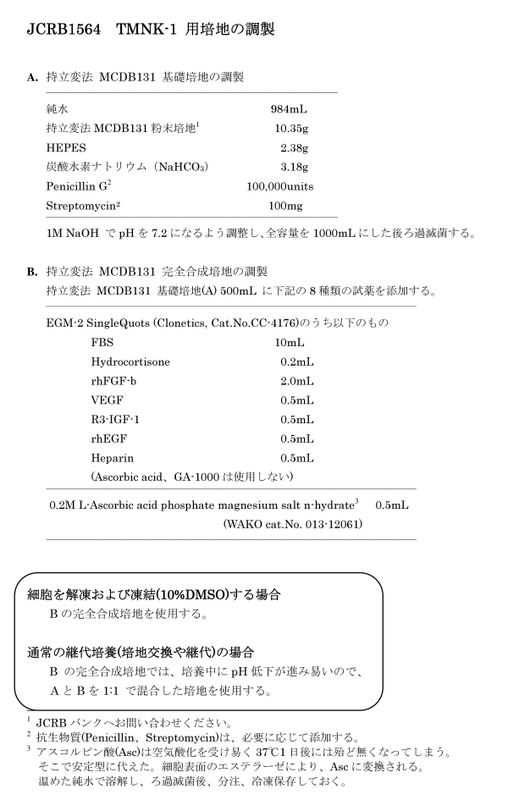 Mycoplasma elimination by MC-210 treatment. 1vial is 0.5ml.